We’re now super deep into our charity challenge with 9 game nights left to decide who is the household board gaming champion and to raise money for Toronto’s Sick Kids hospital! If you’d like to donate to our campaign in support of Toronto’s Sick Kids hospital visit our campaign page. Night 1 of Week 4 went to Rachel so tonight it’s up to me to pick the game. I can win the competition this week so I plan on picking some more hobby games this week and really push Rachel. 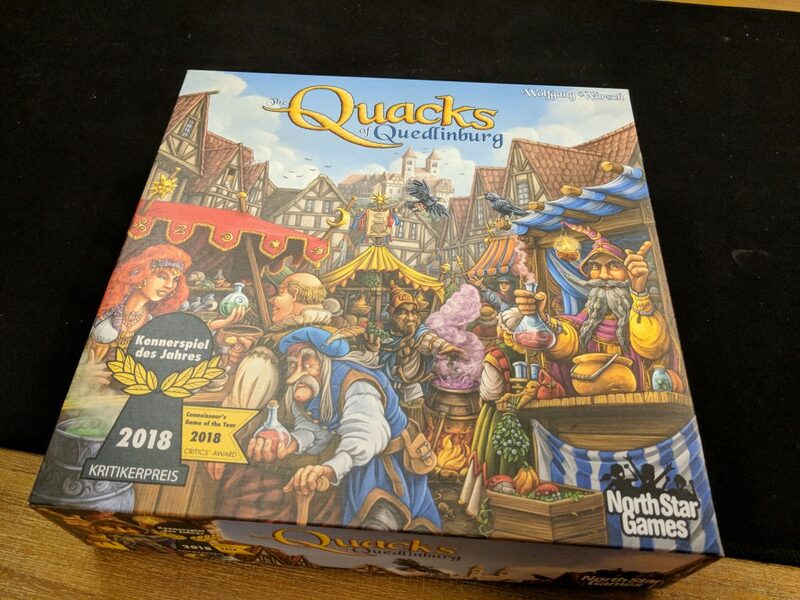 I’m going to start with a fairly approachable hobby game, I’m going to choose a game I just picked up at PAX Unplugged, Quacks of Quedlinburg! Quacks of Quedlinburg is the 2018 Kennerspiel des Jahres award winning game. The Kennerspiel is the German award for hobbyist game of the year and is very highly regarded. 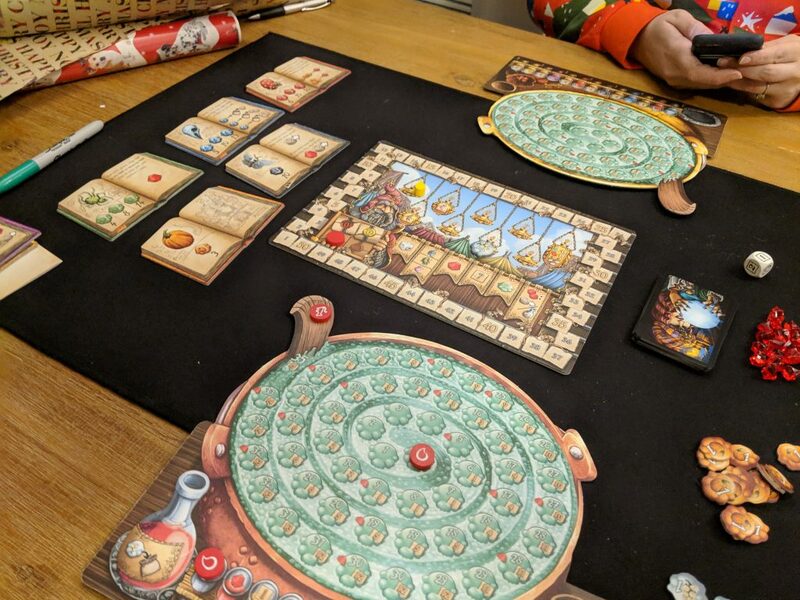 In Quacks of Quedlinburg players play charlatans who are mixing potions, they may or may not know what they are doing. You mix in ingredients that expand your points and purchasing power. The game is a bag builder, so as you purchase ingredients they are placed into your bag and you draw these ingredients out and mix them into your potion, but there’s danger: if you mix in too many white ingredients your potion will explode and you’ll have to choose if you don’t get points or purchasing power that round. The game is fantastic and one of the best of new games I’ve played this year. To learn more about the game check out this video. My friend Dimitri convinced me to pick up this gem at PAX Unplugged and I proceeded to beat him on my first play (he has over 20 plays). I was quite proud of that win and very confident going into tonight. Have you met my friend Hugh Bris? In the game there’s what’s called a catch up mechanic, if you’re behind you get boosts in the form of rat tails that give you an advantage in building your potions. So my strategy has been to stay behind and get benefits from the rat tails and then surge forward in the final rounds. 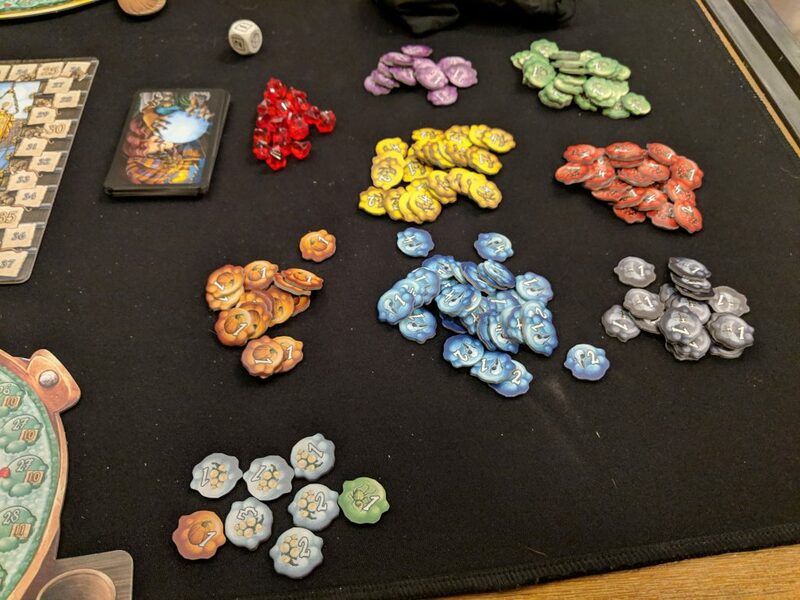 I managed to position myself through the first half of the game but then in round 7 of 9 my potion exploded when I drew too many white ingredients; Rachel surged ahead. In the end my confidence and strategy blew up in my face. Rachel won 79-49, absolutely crushed me. She confidently informed me this was revenge for my beating her in her trump game (Cottage Garden) earlier in the competition. I’m now down 2-0 on the week and Rachel is looking good to take us into week 5 with something to play for for the first time in this competition’s three year history (the competition has not been competitive through 5 weeks, Rachel has won by week 4 in the previous two years). I will not go down quietly though, the games are going to get tougher on Rachel!